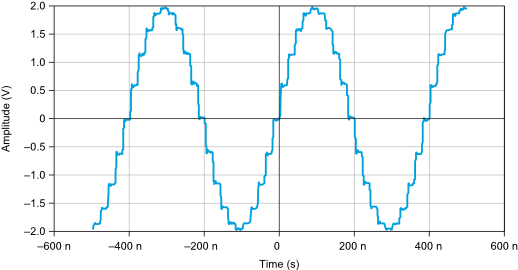 The 16-bit digital waveform data from the Waveform Generation Engine can pass through two resampling digital signal processing (DSP) paths: digital filter enabled or digital filter disabled. You can select the path for the signal to pass through by enabling or disabling the digital filter using niFgen Configure Digital Filter, niFgen_EnableDigitalFilter, or niFgen_DisableDigitalFilter. By default, the digital filter is enabled. When the PXIe-5413 is configured to standard function output mode, the signal bypasses fractional resampling and filtering. 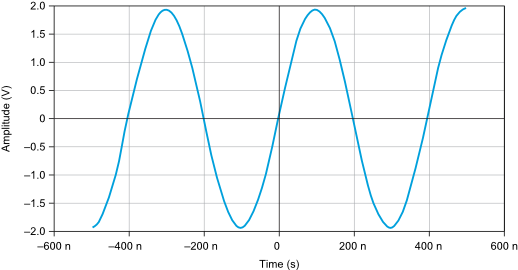 With the digital filter disabled, the waveform output includes an update step at the sample rate you specify with niFgen Set Sample Rate or the Sample Rate property. As a result, the waveform output includes images of the original waveform at multiples of the sample rate. Analog filtering later in the signal path causes the images to roll-off beyond 20 MHz. 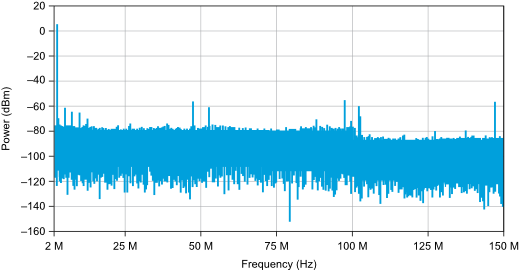 The following figures show 2.5 MHz sine waveform generation at 50 MS/s with the digital filter disabled. With the digital filter enabled, images at multiples of the sample rate are removed from the waveform output. 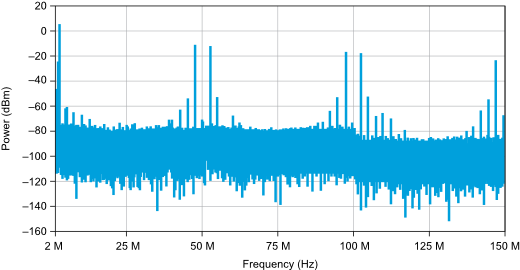 The following figures show 2.5 MHz sine waveform generation at 50 MS/s with the digital filter enabled.